Communications District Calendars PTA Tooele Education Foundation Ophir Canyon Education Center Tooele Education Association Tooele Education Support Professionals Assoc. In the medieval era, knights rode horses as they went into war. 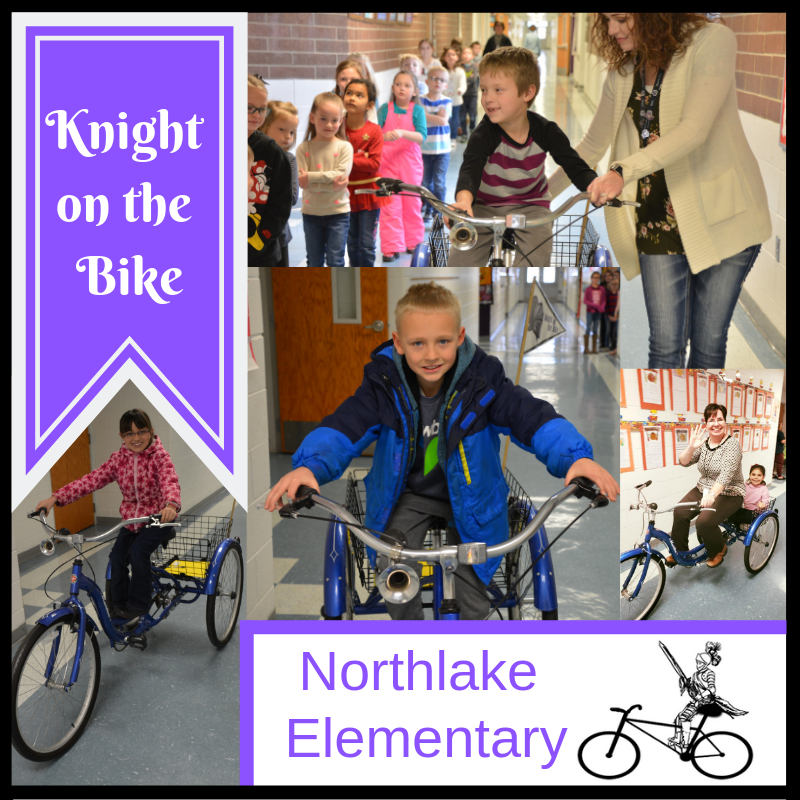 Today, Northlake Elementary School “knights” ride on something a bit smaller and for a different purpose. Once a month, NES teachers nominate a student in their class who has shown growth in their reading skills. The recommended student, (referred to as a “knight” to match the school’s mascot), is met at their classroom, just before lunch, by one of the school’s five literacy aides. The chosen knight gets to take a ride on the school’s bright, blue tricycle. The bike has a giant wire basket on the back and a loud, squeezable bike horn on the front. The bike proudly adorns a triangle flag that reads, “Knight on the Bike” on one side and “Make way for an EXCELLENT READER” on the other. Students can choose to ride by themselves or sit in the basket while a staff member pedals. They ride through the hallways to the lunchroom or around the school’s entryway honking the horn to announce their accomplishments. Students in the hallways pine for their turn on the bike while Literacy Aides encourage them to keep turning in their reading minutes for their chance to ride. About 10 years ago, Tooele County School District Teaching Mentor, Debbie Bird, was an Instructional Coach at NES. At the time, students were participating in Ken Garff’s Road to Success Program which aimed at helping students improve their literacy skills through incentivized daily reading. For every 100 minutes of reading students completed, they received a ticket for a drawing at the end of the year which included a chance to win a new bike. To add more fun to the program, Bird decided to purchase the adult tricycle and ride it from class-to-class to collect reading minutes. She would show up at a classroom, honk the horn and teachers would send out a student with the classroom’s reading results. She would then pile the papers in the bike’s basket and move on to the next classroom. When she took a new position at the district office, Bird donated the bike to the school. Over time the program evolved, and one student would be selected from the ticket entries used in the Ken Garff program to be the reading minute gatherer. They were referred to as a “Noble Knight” and the bike was called “The Noble Steed.” For a time, the bike was outfitted with a white horse cutout that covered the tires of the tricycle. Although NES no longer participates in the Ken Garff program, staff members found a way to continue a reading-rewards program for students. The new program was spurred by the story, “Duck on a Bike,” by David Shannon. In the story, a duck is seen riding a red bike around the farm while the other barnyard animals mock him and his bike. But, by the end of the story, all the animals have a change of heart and are seen riding around the farm on bikes as well. Northlake Elementary Literacy Coach, Linda Sehlmeier, said it is all about celebrating a student’s progress in reading. To highlight the students’ success to a wider audience, students have their picture taken as they ride and Principal Renee Milne puts the photos on the school’s Facebook page. Be on the lookout at Northlake Elementary and congratulate the student riding through the halls on the blue tricycle.